The last thing anyone wants or needs is to struggle with a garage door that doesn’t want to open or shut as it should. Not only is it annoying to deal with while coming and going, but it also poses a risk. If your door won’t close properly, it leaves any belongings inside the garage, as well as your home itself, open to thieves. Rather than risk this, or your door refusing to open when you have places to be, it’s best to let our team help you! You want to be certain that you’re receiving the best services for your garage door, and with us you can be sure of that! We’ve been working in the area for years providing the highest quality work to our local customers for a fair price. Our experts will always be out as soon as they can to begin fixing whatever has been bothering your door, and also happily provide emergency services if needed. We’ll talk with you to find the best time in your schedule for us to come, as well as the most suitable solution for your needs. We understand that you have a lot of things on your plate already, which is why we’ll make sure that our services will be as quick and painless as possible for you! We use the finest tools and materials available so our work will last you for a long time. 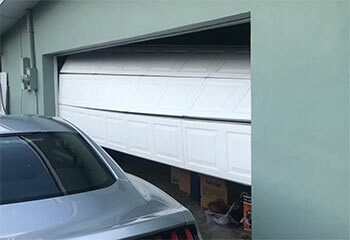 No matter if the damage came from an accidental car bump, or simply wear and tear from years of use, we’ll be able to repair or replace any damaged parts of your garage door in no time. Rollers may rust or brittle, tracks can become tweaked, and the panels themselves get dented and crack. Don’t worry! We use the best parts available to ensure that everything will work properly again. Allowing these troubles to continue will only worsen them over time, so it’s best to get it all fixed now rather than put it off for later. Your garage door makes up a huge portion of the front of your home, and can make a big impact on that all-important first impression! Whether you’re looking to up curb appeal, or are just in the mood for a fresh look, installing a new door can be the best way to achieve either. We work with all the popular manufacturers like Sears and Raynor, so whatever door you’re interested in, we’ll be able to install it easily. Our professionals will remove your original door, then connect the new one and test to ensure it’s working perfectly. Daily use over the years can cause your garage door’s opener to have trouble due to wear and tear. You may notice signs such as your door struggling to open or close correctly, making a lot of noise, or jerking as it moves. If you notice any of these issues, just contact our technicians! We’d be happy to come out and take a look. We’re familiar with all the major brands, so no matter if you have a Chamberlain or a Genie, we’ll be able to repair it and have it like new again before you know it. 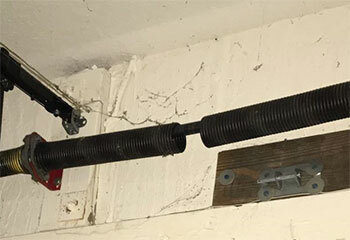 Whatever type of springs your garage door has, you can rest assured that we’ll be able to take care of them! Torsion springs work by twisting up tightly to store energy that’s then used to lift the weight of your door, while extension springs do this by stretching out. In either case, they may require attention over time, which is where we come in! They may simply need some adjustments, or have to be replaced altogether. Whichever the case, it’s best to let the experts handle it! DIY is far too dangerous, so for safety’s sake, let us assist you. It’s time to make sure that your home’s garage door will be in the best shape possible for years to come! Regular maintenance will help keep your door working smoothly and quickly, as well as protect against any future emergency issues in the making. Our inspection of the entire system will allow us to catch early signs of trouble before they begin taking a toll and tend to them now so you won’t need to worry about them later. 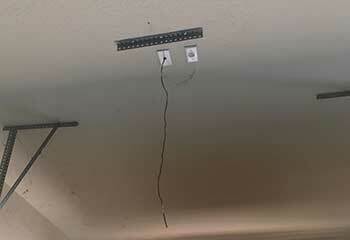 We can also perform thorough safety sensor testing to ensure that your family is protected from any potential danger. Let us help you like we helped our customers! Scroll down to check it out! This customer needed us to help him install a new opener he had bought. Learn more here. Broken springs are no match for us. Find out what we did to help a customer with this type of problem. 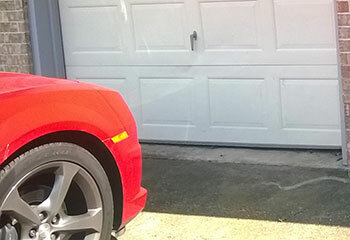 We helped Mr. Lee after his garage door was accidently damaged by his neighbor. Click here to find out more. We were able to help Mrs. Jackson after unexpected problems made her door get stuck. Find out more here. Boy, am I glad I called you guys after my door got off track. Your technician quickly fixed the problem and popped the rollers back into place. I couldn't have hoped for a more professional service. Thanks again. I'm very happy with the new opener you guys provided me. I can't tell you the difference it's made on my daily routine. Really glad I called your company. The new garage door your team installed for me has been working wonderfully. Thank you for being patient and for answering all of my questions.